What is the best store fixture for self-service customers? 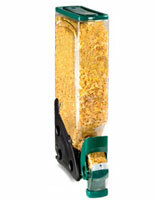 Gravity dispensers do an excellent job of displaying your product while maintaining its freshness. 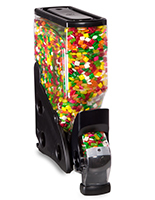 The clear plastic bins come in a wide variety of sizes (by the gallon) and their modular design allows for them to be stacked together in rows to accommodate candy, coffee beans, or other dry good. 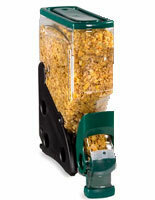 These gravity dispensers feature pull handles for bulk dispensing however there are some models that come with portion-control paddle wheels. Perfect for candy shops, health food stores, and supermarkets, the acrylic containers are clear to show off their contents. This is especially advantageous for candy shops that like to present patrons with an entire wall of colorful offerings. In addition to our selection of gravity dispensers, we also sell the stands and locking strips for a large scale installation inside your store. 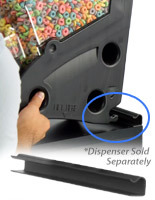 What kinds of features come with these bulk food bins? 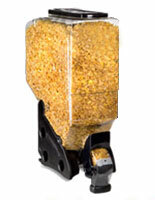 These gravity dispensers are available in incremental sizes ranging from 1 to 12 gallons. The clear containers are manufactured from polycarbonate plastic which is much stronger than typical acrylic. This material filters out harmful UV light rays to maintain freshness. You have your choice of accent colors for the top lids and pull handles: black, green, red, or purple. The handles feature continuous flow, but come with a pin for controlling how wide the aperature is opened. False fronts hold a small amount of product for easy identification and also provides your installation with an "always full" appearance. Each model comes with a clear slot for inserting signs. 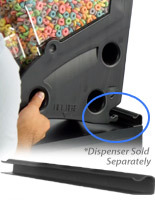 Customize your dispensers with colorful labels that explain the type or flavor of what'e inside. The canisters' slim profile lets you stack many together side by side within a small footprint. 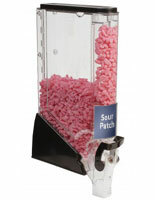 Also available are dispenser stands and special locking strips for holding the units in place. Don't want to use free-standing containers? Check out our wall-mounted models complete with portion-control wheels. 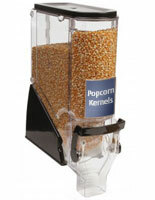 These are normally smaller than the stands and are ideal for storing ice cream toppings and other small items. 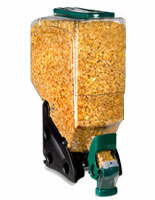 These professional quality bulk food bins are designed for dry produce only, no liquids. 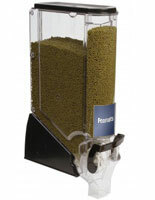 There is almost no limit as to what can be added for dispensing. 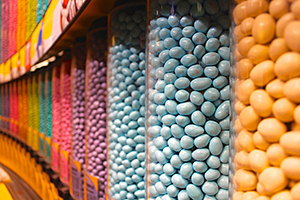 Sweet stores often have entire walls of candy containers stocked with jelly beans or other candies. Supermarkets always have a coffee aisle, where they offer consumers roasted beans in bulk for grinding their own coffee. Health food centers feature expansive dry produce sections stocked with grains, cereals, pastas, fruits, nuts, and much more. All models can be taken apart for cleaning, with some being sturdy enough for the dishwasher. However, there are some parts that may need hand washing (consult your product's instructions). With the many size and color choices available here you have the means of creating an impressive retail merchandising setup!